On March 19th, Westport, Connecticut will become the first town on the East Coast to ban plastic bags in all retail locations. The legislation was first introduced at Westport’s Representative Town Meeting in July of 2008 and finally received enough votes (26-5) to pass that September. Concerns raised by the opposing voters included an increase in demand for paper bags which require more energy to manufacture and transport and the reusability of plastic bags beyond their initial use. The town’s overall goal is to steer consumers away from disposable bags and towards reusable bags in order to lower negative, environmental impact. 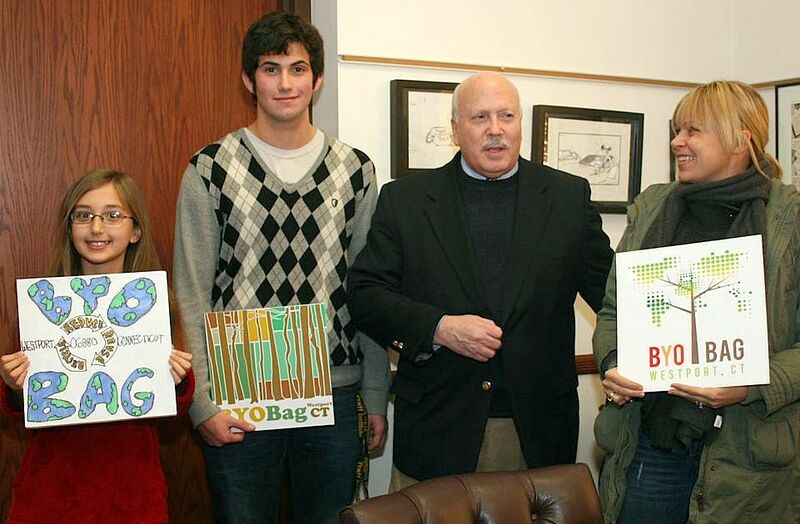 The town has sponsored a reusable bag design contest for children, teens and adults and will offer each category winner’s bag design for sale. Anna Daytz, 10. of Westport; Ross Gengels, 17, of Westport, and Sandra Neva Schultze of Stamford. Congratulations to the winners! Though when it comes to decreased plastic bag consumption, there really are no losers.